Woodhouse's Phlox is a member of the Phlox Family. It grows to 6 inches in height and has thin, shiny, stiff, dark green leaves to 2 inches in length. The plant typically grows in coniferous forests at elevations between 3500-8000 feet. 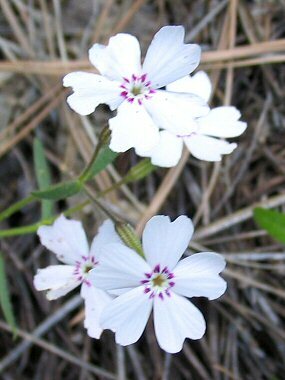 Both the white and pink variations of Woodhouse's Phlox are shown in the photos on this page. 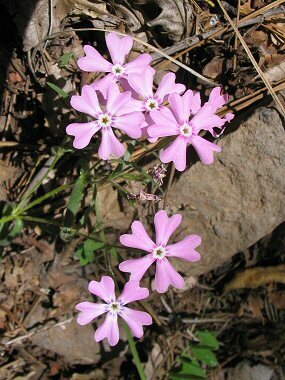 Woodhouse's Phlox typically blooms between in the Spring and Fall and produces pink or white flowers with 5 petals and a white central eye which grow to 3/4 inches in width. The petals are wedge shaped and have a notch at the end.